Choosing to get a new dog can be a tough and stressful process. A new dog does not necessarily mean puppy. Most times it is a puppy and a full blooded breed. More and more people are going the rescue route, but there are very many that still believe a full blooded dog is the best route. If this is the path you have chosen, then there a few precautions you should take when communicating and purchasing from a breeder. Below, there are three areas in which breeders can and will feed on your ignorance. Within each area, you have to make a conscious choice on whether or not you can rely on what you’re being told. This article is just to make you aware of certain aspects of the pure breed buying process. It is not intended to trash breeders, nor is it intended to be a deterrent for buying a pure bred dog. 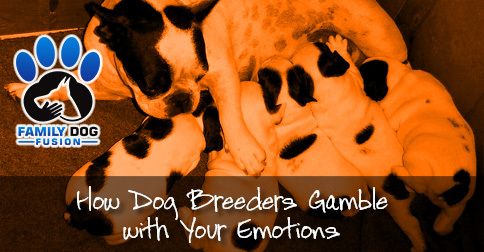 Going to a breeders facility can always be an emotional journey. Most of the time you just get to see the puppies. Cute, cuddly, soft, and many. So many, in fact, that it’s hard to just pick one. Also remember, the breeder is a sales person. It is their job to sell you a product and move on to the next customer. This also means up-selling. Can they sell you more than one pup? Can they convince you to upgrade? Even though you are dealing with live animals, it is still the breeder’s living, and that living is selling dogs. They do not want browsers, and more than likely you were screened on the phone interview. You are there to purchase and they are there to sell. How trustworthy are the people you are dealing with? Have you done your research? We are not just talking about looking at their website or the Facebook page, we mean really researching them. Look for blogs, Google the business, look for veterinarians in the area and call them. Find out who the breeder uses for a vet. Many breeders consider themselves vets, trainers, and groomers. It is up to you to find out what people around them think. Ask your breeder for a few references. How do they stand-up to their reputation? Will they let you into the breeding area, or do they meet you somewhere off-property? Are they willing to give you veterinary references? If your intuitive feeling is negative because of something the breeder said or did, trust it. There are so many choices out there. Don’t get stuck on one breed or one breeder. Research two or three different types of dogs so if you cannot find a good breeder for one, you can find a good breeder for another.